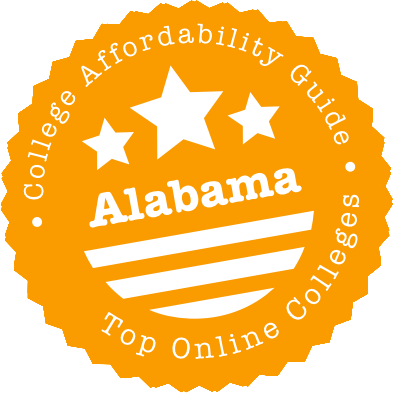 Scroll down to see the top not-for-profit colleges and universities in Alabama offering online degree programs. The College of Health and Human Services at Troy University offers the following programs online: RN to BSN, Master of Science in Nursing (Family Nurse Practitioner or Nursing Informatics Specialist), and Doctor of Nursing Practice. The university also offers an online Doctor of Philosophy in Sport Management degree. Online undergraduate programs are available in several fields of study, including hospitality management, human services, information systems, resource and technology management, and social science. Students who are interested in earning their MBA from Troy University have the option of completing their degree online. The university also offers online graduate programs in public administration, sport & fitness management, and international relations. There are several online graduate certificate programs available for students who want to upgrade their current skills, or for those who are not yet ready for the demands of a post-graduate degree program. Some of these include: curriculum and instruction design, instructional technology, leadership studies, workforce development, and health practice management. Students with an excellent academic history and who have completed at least 45 hours of transferrable academic credits may be eligible for the Transfer Merit Scholarship ($3,000) or the Transfer Achievement Scholarship ($2,000). The University of Alabama in Birmingham offers undergraduate and graduate degrees, as well as certificate programs that are available completely online or follow a blended format delivery. The Collat School of Business has Bachelor of Science degrees in accounting, economics, finance, information systems, management, and marketing that can be completed 100 percent online. The School of Nursing's BSN degree is available via distance learning, which combines online delivery with on-campus intensive sessions. UAB currently offers more than 40 post-baccalaureate degrees online, including MA Sociology, MS Management Information Systems, MEng Civil Structural Engineering, and DSc in Administration - Health Services. The MSN program has more than 15 specialty tracks offered online. There is also a distance-accessible dual MSN/MPH program available. UAB has eight academic certificates and five professional studies certificates (non-credit) that can be pursued online. The academic certificates include fields such as social media, school psychometry, global health studies, and public health. UAB participates in the Southern Regional Education Board (SREB), which administers the Academic Common Market Program. This program allows qualified out-of-state online students to pay in-state tuition. The Regional Contract Program for Health Professions is another tuition-saving program for online students pursuing a degree in the health professions. At the University of Alabama in Tuscaloosa, online Bachelor of Science degrees are offered in the following areas of study: commerce and business administration, mechanical engineering, human environmental science, and nursing. Online graduate degrees are currently available in the fields of business (3), communication and information studies (1), education (12), engineering (1), human environmental science (7), law (2), nursing (5), and social work (1). UAB Tuscaloosa offers an online engineering minor in computing technology and applications, as well as online graduate certificates in consumer conflict management, negotiation, and mediation, and in environmental health and safety management. The EdD in Instructional Leadership for Nurse Educators program combines online courses with four on-campus weekend meetings during each semester. Coursework for the Master of Social Work degree can be completed online, but face-to-face skills labs are conducted on selected Saturdays at geographical locations convenient for students. Several College of Continuing Studies Scholarships are available for undergraduate or graduate, part-time or full-time online students. Some of these scholarship programs include the following: Judith H. Wilson Endowed Scholarship (nursing students), William Henry Rhea, Jr. Memorial Endowed Scholarship (engineering or business majors), and the James A. Hood Endowed Scholarship (teaching or school administrator students). The University of South Alabama offers more than 250 online courses each semester and continually adds to its roster of online undergraduate and graduate programs. Students have the option of pursuing a Bachelor of Arts or Bachelor of Science in Interdisciplinary Studies degree online. The College of Nursing offers an online RN to BSN program, as well as MSN and DNP degrees. All required courses for the nursing programs can be taken online, while clinical requirements can be completed in a student's home community. There is also an online Master of Education (M.Ed.) program available. Students accepted to this program can choose from the following concentration areas: early childhood education, elementary education, secondary education, educational media, and special education. The university offers a Master of Science (MS) in Instructional Design and Development which also follows an online delivery format. Students interested in obtaining a Class AA Certification in Teacher Leader can apply for admission to the university's online Ed.S. Instructional Specialist program. Students admitted to the Bachelor of Business Administration program at the University of West Alabama have the option of earning their BBA degree online. The following concentrations are offered - accounting, business administration, management, and marketing. Two Bachelor of Science (BS) programs are also available online - BS in Technology and BS in Early Childhood Development: Non-certification. On the graduate level, UWA offers the following online programs: Master of Arts in Teaching (MAT), Master of Education (MEd), and Education Specialist (EdS). MEd students can choose from a number of concentration areas (all of which are available online), including early childhood education, instructional leadership, library education and school counseling. An online Master of Science (MS) in Experimental Psychology is also available. In the fall of 2015, UWA started offering an online Master of Business Administration (MBA) program with a general business or finance emphasis. In order to be considered for financial assistance, online students must be enrolled at least half-time. A full-time load for undergraduates is 6 credit hours per term, while a full-time load for graduate students is 3 credit hours per term. Although there are five 8-week online sessions in one academic year, financial aid is awarded for the entire year. Athens State University offers a variety of online certificate and degree programs in the fields of business, education, and religion. The College of Business has the most online programs, including a master's in global logistics and supply chain management, seven undergraduate business degrees, and half a dozen certificate programs. The College of Education offers several undergraduate degrees in technical education and specialized certificates for educators. Other online options include a master's or bachelor's degree in religion. Students who want to achieve a minor in instructional design or in a wide range of business subjects can do all that coursework online, too. The list of online degrees at Jacksonville State University is long and diverse, ranging from bachelor's degrees to doctorates. The largest group of offerings is for educators, with a dozen master's and six educational specialist programs online. The next biggest grouping is nursing programs, allowing nurses to complete a BSN, move up to an MSN, or earn a Doctor of Nursing Practice. Other online programs include several concentrations for the Master of Public Administration and degrees from BS to Doctor of Science in emergency management. An MBA and computer science degrees are also online. Jacksonville State University is the alma mater of many professional athletes, along with Pulitzer Prize-winning author Rick Bragg. Some courses for career and professional programs at Jefferson State Community College are offered online. The college's veterinary technology program is offered completely through distance education, and the program is one of the top programs in the U.S., according to a website that specializes in veterinary education. To take part in this program, students must be employed by a veterinarian in Alabama or volunteer at a vet facility at least 20 hours per week. Students take theory classes online and practice clinical skills at the vet facility where they work. However, students might be required to travel to meet requirements involving the care of large animals and laboratory animals. Students can enter the program in the spring or fall. Auburn University offers a wide selection of undergraduate courses online. The only undergraduate degree that can be obtained entirely online, however, is a Bachelor of Science in Accountancy, which is designed for second degree seeking candidates who have already fulfilled their general education requirements. Online graduate degree programs are more abundant at AU, with the largest number of degrees offered in the fields of education and business. Some online (or distance education programs as the school refers to them) require short visits to campus during the course of the program, while others are conducted entirely online. AU also offers professional certificates and personal enrichment programs online. UNA students can opt for distance learning to earn degrees such as a Bachelor of Arts or Bachelor of Science in History and Political Science, Bachelor of Interdisciplinary Studies and Bachelor of Arts or Bachelor of Science in Sociology. The university uses Canvas as its online course management system. UNA's online degree courses are fully accredited by the Commission on Colleges of the Southern Association of Colleges and Schools. UNA also offers post-graduate online degrees in a wide range of academic disciplines. The online degree options available at Faulkner University range from associate to doctoral degree programs. Students can pursue either an Associate of Arts (AA) or an Associate of Science (AS) degree in liberal arts or an AS in Computer & Information Science degree. Bachelor of Science (BS) degrees are offered in seven areas: business, counseling psychology, criminal justice, forensic psychology, general/clinical psychology, health & rehabilitation psychology, and sports psychology. Faulkner University also offers an online Bachelor of Arts in Humanities degree. The BS in Business program has four areas of concentration: business management, logistics management, health administration, and website perspectives for management. On the graduate level, Master of Arts (MA) degrees are offered in the field of biblical studies, Christian counseling and family ministry, Christian ministry, humanities, and teaching English. Students interested in pursuing a Master of Education (M.Ed.) degree can explore the M.Ed. in Elementary Education or the M.Ed. in English Language Arts programs, both offered online. An MBA program, a Master of Justice Administration degree, and an MS in Counseling degree round off the university's online options on the master's level. The two doctoral degrees currently available online are Doctor of Philosophy (PhD) in Biblical Studies and PhD in Humanities. Samford University in Birmingham, Alabama, has a variety of online programs for students who want to earn a master's degree in fields such as business or education. The Brock School of Business has a totally online MBA program that offers flexible scheduling and a rolling admissions policy. MBA students may earn a general MBA, or by taking just one more approved elective, they can earn a concentration in marketing, finance, or entrepreneurship. The Orlean Bullard Beeson School of Education has an online program resulting in a Master of Science in Education in Elementary Education. The 30-credit program is open to students who have an undergraduate degree in elementary education. The Department of Interior Architecture has an online Master of Science in Design Studies for students with professional experience in design fields such as landscape design, architecture, or interior design. Cohorts begin in the summer, and students must come to campus for an orientation weekend. The design studies program runs for 24 months and covers 33 credits, including a master's thesis. The following Master of Science (MS) degrees are available online at the University of Alabama in Huntsville: MS in Human Resource Management, MS in Supply Chain Management, MS in Business Analytics, and MS in Information Systems. Each degree is comprised of 30 credits and can be completed in one year. Students can start a program in the fall, spring, or summer semester. The university offers online graduate programs in the field of education as well. The following Master of Education (M.Ed.) programs are currently available: M.Ed. in Elementary Education, M.Ed. in Secondary Education, M.Ed. in Autism Spectrum Disorder, M.Ed. in Reading Education, and M.Ed. in English Speakers of Other Languages. There is also an online certificate in autism spectrum disorders available. Master of Science in Engineering programs are offered online in the fields of management, industrial, systems, civil, mechanical, and aerospace engineering. There is also a Master of Science (MS) in Operations Research available online. On the doctoral level, the university offers the following Doctor of Philosophy (Ph.D.) degrees: Ph.D. in Engineering Management, Ph.D. in Industrial Engineering, Ph.D. in Systems Engineering, and Ph.D. in Mechanical Engineering. Two online inter-disciplinary degrees are currently available: MS in Cybersecurity and MS in Software Engineering. Auburn University at Montgomery offers a variety of online programs in the fields of education, health sciences, public policy, and arts and sciences. Online students have the option of earning a bachelor's degree, master's degree, or certificate. AUM's online classes are primarily delivered in an asynchronous format that gives students the flexibility to participate in class at the time of their choosing. The College of Arts and Sciences offers a Master of Liberal Arts online that allows students to select a specialty in one of the liberal arts, such as English. It is the only interdisciplinary master's program in Alabama. The College of Education offers master's programs in physical education and instructional education, and education specialist programs in special education, early childhood education, elementary education, instructional technology, and physical education. The College of Nursing and Health Sciences offers a RN to BSN program, Master of Science in Nursing, and a degree-completion program for medical laboratory technicians. The College of Public Policy and Justice offers master's programs in justice and public safety/criminal justice, and homeland security and emergency management, as well as graduate and undergraduate certificates in geographic information systems. Once you’ve made the decision to earn an online degree in Alabama, you may have tons of questions. For example, is there a way to search for online courses across schools? Are there special programs or discounts for distance learners? Which universities are the most respected and the most affordable? How do I check for regional accreditation? To help you make the best use of your money, we’ve put together this quick guide to choosing an online program in Alabama. It has info on everything from tuition grants and rankings, to profiles of affordable programs, warnings about non-accredited schools, and links to useful distance learning websites. Southern Regional Education Board (SREB) Electronic Campus has teamed up with a variety of southern schools—including many in Alabama—to offer an online program & course catalog. You can search for any degree program or a specific course! Programs that are marked “E” are offered at the Electronic Rate, which means the in-state and out-of-state tuition rates are the same. Participating Alabama institutions in this catalog include Amridge University, Auburn University, Jackson State University, Northwest-Shoals Community College, Troy University, United States Sports Academy, University of Alabama (including Birmingham), and the Universities of North, South & West Alabama. If you’re thinking of an out-of-state online college degree, you may only need to pay in-state tuition rates! The SREB also runs the Academic Common Market-Electronic Campus (ACM-EC), which is designed to support students who can’t find certain degrees in their home state. These approved ACM-EC programs must be in one of the 15 participating SREB states. Also, you won’t be eligible for discount tuition rates if a public college or university in Alabama already offers a degree program in your chosen field of study. To apply, you will need to meet admissions requirements of the college or university that offers the program and be certified as a resident of Alabama by an ACM coordinator. Visit the website for instructions. You earn an associate degree at your local community college (any school in the ACSS system). You apply to a distance learning bachelor’s degree program at UA. If accepted, you may be eligible for a modest tuition grant. The grant covers the cost of one 3-credit-hour course during your first semester. ACSS faculty and staff are also eligible to pursue a UA distance learning degree and apply for the grant. 4. Working or Military? Check Out UWA Online’s Connect Program. The University of West Alabama (UWA) Online has developed a number of Connect Programs to support military (including active military members, veterans, spouses, and dependents), teachers, and employees of Alabama businesses. These programs usually offer discounted tuition & scholarships to participants in its distance learning programs. For example, the Teacher Connect Program gives working teachers a discount of $200 per credit hour for online studies (i.e. graduate education degree with teacher certification). To determine if you’re eligible, ask your employer or school system if it participates in a Connect Program. Alabama has four major public universities: The University of Alabama (UA), the University of Alabama at Birmingham (UAB), The University of Alabama in Huntsville (UAH), and Auburn University (AU). These are sometimes called Tier 1 schools, since they appear on U.S. News & World Report’s National Universities Rankings. Because they have large endowments, strong research, and good faculty, these schools—especially UAB and AU—also tend to do very well in U.S. News & World Report’s online rankings. We talk more about them in our section on Affordable Online Schools. There are exceptions to this rule, of course. Faulkner University often scores in Best Online Graduate Criminal Justice Programs (e.g. top 20). But there is usually more consistency with the big schools. These schools made both our “Top Online” and “Most Affordable” lists. That means they meet our criteria for quality, flexibility, price, and use of financial aid money. (You’ll see a CAG Score next to their profiles in our ranking.) When you’re comparing these schools, we also recommend you check the school’s graduation rate and debt load on College Scorecard. UNA Distance Learning has info about all of its online courses and programs, including links to financial aid services and relevant scholarships (e.g. out-of-state tuition waiver). UNA has a dedicated online MBA. And, like so many Alabama schools, it also participates in the QM Higher Education program. If you’re thinking of transferring from a community college, you can check out the school’s helpful transfer guides. Alabama doesn’t have a great track record of punishing degree mills and unaccredited universities, so it’s very important that you check that your online school is fully accredited by an organization recognized by the U.S. Department of Education. Avoid any school that makes vague international accreditation claims. And although national accreditation applies to distance learning institutions, regional accreditation is the gold standard. The Southern Association of Colleges and Schools Commission on Colleges (SACSCOC) provides regional accreditation for degree-granting higher education institutions in the Southern states (including schools with associate degrees). The homepage allows you to search for accredited institutions by state. While you’re on the website, we also recommend you take a quick look at SACSCOC’s Accreditation Actions. This will tell you if your school has recently received a Warning or Probation. Warning is the less serious of the two sanctions. You can cross-check these results using the Council for Higher Education Accreditation (CHEA) Database. We also list some of Alabama’s online schools with accreditation issues below. Chadwick does not appear in College Scorecard or the CHEA Database, and it holds no recognized national or regional accreditations. In 2015, Channel 4 News reported that the school had “become so notorious that the use of Chadwick degrees to seek employment is illegal in Texas and banned in other states.” The school was established by Lloyd Clayton, who has been criticized for running a diploma mill with the Clayton College of Natural Health. According to the CHEA Database, Herzing is regionally accredited by the Higher Learning Commission (HLC), but College Scorecard reports that the Birmingham campus has a low graduation rate. The school controversially changed its status from profit to non-profit in 2015. The school was profiled in The Century Foundation’s 2015 report, The Covert For-Profit, which heavily criticized the move. Huntingdon College is regionally accredited, but the school was placed on Warning by SACSCOC in June 2016. A review of the institution’s Fifth-Year Interim Report in December 2015 indicated a failure to provide an “adequate number of full-time faculty.” This Warning is reviewed every six months. This for-profit school does not appear in College Scorecard or the CHEA Database, and it holds no recognized national or regional accreditations. It has a long history of controversial international activity, and the university’s license to operate legally in Alabama expired on December 1, 2008. According to the CHEA Database, Remington College is nationally accredited by the Accrediting Commission of Career Schools and Colleges (ACCSC), but it is not regionally accredited. Remington was originally for-profit. The New York Times reported that Remington College, a “Florida-based for-profit school, was sold to a nonprofit with the owners lending it $136 million for the sale” in 2011. Like Herzing University, Remington came under strong criticism in The Century Foundation’s 2015 report, The Covert For-Profit. South University is a for-profit school owned by the Dream Center Education Holdings. The university came under fire under its previous ownership (by Education Management Corporation / EDMC) for its aggressive & misleading recruitment practices. Spring Hill College is regionally accredited, but the school was placed on Probation for six months by SACSCOC in June 2016. This was mainly in response to financial concerns. During the Great Recession, the school’s endowment dropped by approximately 30%. Tuskegee is regionally accredited, but the school was placed on Warning by SACSCOC in June 2016. This was a continuation of a one-year Warning implemented in June 2015, when SACSCOC had compliance concerns with the school’s fifth-year report covering the years 2008-2013. The University of Atlanta was formerly known as “Barrington University,” which was a for-profit school operated by Virtual Academics in Boca Raton, Florida. For a time, it held Distance Education and Training Council (DETC) accreditation, but it resigned that accreditation in 2013. As of 2016, the University of Atlanta does not appear in the CHEA Database, and it holds no national or regional accreditations that are recognized by the U.S. Secretary of Education. University of Phoenix is a for-profit institution headquartered in Arizona. According to the CHEA Database, it is regionally accredited by the Higher Learning Commission (HLC), but it has been subject to a number of lawsuits regarding recruitment practices. College Scorecard reports that the Birmingham campus has an extremely low graduation rate and a low number of students who return after the first year. Southern Association of Colleges and Schools Commission on Colleges (SACSCOC) : Also known as SACS, this is the regional accrediting body for degree-granting higher education institutions in Alabama. Alabama Connecting Classrooms, Educators, and Students Statewide (ACCESS): This resource is for Alabama public high school students who are thinking about taking online Advanced Placement (AP), electives, and similar courses through distance learning. It’s run by the Alabama State Department of Education. Southern Regional Education Board (SREB) Electronic Campus: SREB allows you to search for online degree programs or courses being offered by participating institutions throughout the southern states. The website also has answers to FAQs (including info about transferring credits), a section on financial aid, and a list of online programs that qualify for in-state tuition benefits.